In conversation with Ratan Batliboi, Principal, Ratan J. Batliboi Consultants, we discuss exhibition design as a discipline and an area of his creative endeavour, drawing from his exhaustive portfolio in design of an array of temporary and permanent exhibitions and his insight into the processes that work on the front and back-end of the experience. Q: Tell us about your interest in designing exhibitions. How did you get initiated in this discipline? Ratan Batliboi [RB]: Through college, I used to work on technical aspects of fashion shows for my aunt. I was always interested in the backstage-frontstage stuff and exhibitions just fell in our lap. I was once speaking with Maitreya Doshi and his father Vinod Doshi of Premier Automobiles about doing a show in a factory and they were participating in an auto expo. Thus, the idea of the exposition space as an exhibition emerged. This first exhibition that we designed was 25,000 square feet display in the good old Hall of Nations at Pragati Maidan. It was great fun and since, we started designing for this expo every two years. All our initial clients were in the ‘Auto’ space – Premier, Bajaj and many accessory companies. We used to work on exhibitions, November through January. In parallel, I used to practice architecture and interior design taking on as many commissions we could, that included film sets, fashion shows and sets for advertisement films. We did an exhaustive lot of work and that is how it all started! Q: What are the fundamentals for understanding and designing an exhibition? RB: Let us look at client-driven exhibitions and sometimes, client-driven exhibitions reflect the clients’ personality and the personality of the brand or the specific product that one is exhibiting. We realised that we used to work a lot on integrating the client’s or the brand’s perception about itself against what we, as designers, wanted to project or present. This process was quite exciting as these relationships and ideas were strongly spatial – our exhibitions were three dimensional and they were not about plastering graphics on the walls. The space was more sculpted and we designd in a way that people went under, over and around the space. Being architects, our sense of spatial design was very different from a graphic-design firm. The core idea and the point of departure would come from the nature of content and user of the exhibition space. My exhibition team has always been non-standard. I would bring in anybody who I felt would be exciting to bring on board. Over time, we nurtured a team of professional contractors who had a diversity of skills and execution acumen. Q: In the other kind of exhibition – the one in which you have to deal with curators of art and intellectual content, what is the process of design like? RB: When one designs permanent and specific exhibitions like the ‘Coin Gallery’ for the Reserve Bank of India, one has to design a museum exhibit. A historical background and a curatorial inclination is very important in such commissions. In a recent exhibition titled ‘Ten Art’ that we designed with curator Veerangana Solanki, she brought in ten artists to interpret in their own way, the life of Sachin Tendulkar. The whole structure was created around the idea of bringing art to the masses through a popular subject and an iconic sportsman. Veerangana had curated the exhibition very carefully and it was not just about pictorialising Sachin and decorating him in media. Rather, it was about stories of his life, the ways he was reading into things, his innings and his extreme passion for the game. We took up the whole NGMA and structured the project which was very well-received. So, where the curator brings in content in a purist understanding, the curator is also critical to establish a flow that is desired: the grouping and sometimes, the zoning. It is a great experience working with a sharp curator. Sometimes, curators get carried away and give you seventy two pages that you have to condense into three lines which you probably have to title into four words. So that really tough editorial skill some curators have and some do not. Working with curators can also be as painful as it can be exciting since they have their own way of looking at things. While they look at the heaviness of content, we have to look at the lightness of content in the entire visitor’s journey – the experiential quality of the exhibition is important to the designer. Q: How involved are you, as a designer, in the curatorial conversation? RB: I like to get extremely involved in the conversation, because unless we understand the subject-matter thoroughly, we are not going to be good at what we do. We have subject-matter specialists for the same reason on our team. I often say, “I am the only Jack in my business”. Everyone else is an expert. While my broad understanding is important, my team would be completely immersed in the content of the exhibition. They are the ones who get into conflict with the curators as a personal point-of-view is established. I think it is critical to understand how a detail is communicated. An exhibition is only about communication. It is the elevator test situation where you have to communicate the entire concept of what you want to say in probably a one minute walkthrough or a five-minute duration and it should be good enough to last you for four hours if necessary. There is also a great distinction between temporary and permanent exhibitions. Q: What is the value of human engagement in your exhibitions? Are you always imagining how people would react to the things you design? RB: We are always looking at the exhibition from multiple points of view to primarily understand the way the visitor would look at it. We have a method of presenting the curator or the client the exhibition from the human perspective and they see their project in a completely different light. We are conscious of the engagement of walking through the exhibition and its directionality. Sometimes, exhibitions are very directional and sequential. Sometimes, they are simultaneously experiential and sometimes they are multidirectional. For example, in the Indian Art Exhibition, the sculpture punctuates the pieces of art. There is no real order unless it is a chronology or a monograph of the artist or something like that. The human is very critical to the exhibition space and you realize that you have a narrow space – from two and a half feet from the ground till about eight feet – to engage at that level. Everything else is experienced in scale – an installation or a large graphic panel. It is important to also consciously see how crowds are managed because crowds are very critical and we do not design exhibitions for the opening night. We design them for the trickle of viewers that progressively visit. Handling people is also important. There is a classic Indian mentality of touching things or wanting to touch things and wanting to go close to smell. The demographic profile is also critical. If I have to design an exhibition for children, everything changes again. As designers, we have to be continuously conscious about this. Q: How different are your exhibitions today as compared to when you had started? RB: We started with simple formats. We never did plaster graphics on the wall. I was more interested in sculpting space. Today, we use a lot more technology: animatronics, holographic projections, screens, multiple projections, video-mapping and many other things that make the interface. It is a combination of the dark box and lighting, wherein we work on the content and experience with all kinds of technology. Today, the exhibition experience leans on technology and much less on space. While earlier, exhibitions used to be about space, today, space has become expensive so there is a premium to the experience in that space. We do not have the same luxury of space any more as compared to where we started. The twenty to thirty thousand square-feet that we used to work on earlier is not compressed in social media. So the content is compressed from this twenty thousand square-feet to the small screen but there is joy in exhibition. While the exhibitions of the past focused on experience, today, we have exhibitions which hinge on interaction. We also have to be conscious about the conversations that happen around the exhibition space – the discourse! RB: Luckily for me, I had worked with the stage for a long time doing theatrical lighting so lighting is built in my mind-space. Exhibitions tend to be abusive of lighting. The lux levels bleed and wash out everything! So, the multi-stall exhibits are a challenge. But when one is working on a museum or an art-space, or even an exhibition that deals with objects, you have a huge amount of flexibility to work with the best lights possible. We tend to design our own lighting and not rely on the lighting provided by the space. This is precisely because we understand how one lights different planes or how one looks at shadows or how one looks at the viewers’ comfort because one does not want to see the glare or reflection. When we light permanent exhibitions, historic and sculptural pieces of art, we are concerned about the UV specifics of the light and the heat generated. In the old days, one had to work with reflectors and they bleed light all over the place but now, you can use very tight optics with very focused beams and interesting light qualities. One can work with colour temperatures as some objects are comprehended in yellow light while some are better in white light. Q: Do materials inform exhibition design? What kinds of materials are you used to working with? RB: Contemporary exhibitions have large budgets – almost comparable to a permanent space. But because most exhibitions have a limited life, one can be more experimental with materials. Since the longevity is not a discussion, we use a very wide palette – aluminium, plastics, thermocol, fabrics, metallic foils and polyesters. It is very exciting and intriguing to study the behaviour of these materials, their compatibility and as a designer, one can cut, fold, bend, mould, blow, and so on. Most manufacturers give us materials to fool around with, before we use it at scale and in mainstream exhibitions. Q: How do you keep up with the pace of change? RB: We do not take too many exhibitions now because it is hugely trying. I have become very selective about what we take on as exhibition design now. It is very critical to stay in touch with what is happening on a daily basis. When I see the books we used to refer to in the 80s and the 90s, I wonder why we ever did anything like that! Technology has changed and the designers are experimenting substantially. One can get dated very fast in this field of work. The constant process of designing and referencing gives a lot of creative freedom to my team – the team is allowed to fly and there is no restriction. The bottom line is that the design has to be buildable. Q: What are the essential ideas in working with graphics? – typography, legibility, colour, figure-ground etc.? RB: When we talk about exhibitions, we are talking across everything – from temporary to permanent and from white-box to black-box. Some exhibitions are static and some have dynamic technological input. One also has to account for people moving in the exhibitions against people sitting and observing. There are many exciting formats. Graphics are very crucial to exhibitions as one has to capture the message really fast, and with precision. We are extremely focussed about typography and legibility. We consider the distance of viewing and the priority of message. I have my favourite fonts as well. Our graphic schemes are reactive to the content of the exhibition. Colour sensitivity is also very critical because sometimes, one can go overboard with it. Colour plays an important part in establishing the mood of the viewer. We also often work in several languages so it becomes very critical for us to compose these languages across exhibits. Q: You have expressed that many have learnt and trained in the process. What is your engagement with the people who work on the execution end? RB: The interesting part of our studio is that we also do interior design and architecture and these domains develop other kinds of skills that one brings to exhibition design. In most cases, the exhibition designers are refined film-set creators. Film sets have this crude back-end that exhibitions cannot have. Our execution team is much more refined as they have been traditionally trained on architecture and interior design projects. The people who used to work with us initially have all developed their own large businesses while some have specialised and stayed with film-set studios. Exhibition design has also crept into the event space with high-production events, fashion shows, staged plays, and much more in stage and screen. Q: To conclude, tell us a bit about the process and your engagement in the process of design. While you have limited your exhibition design work now, do new projects still excite you? RB: In my position, I usually get the brief from the client. I will interpret the brief primarily because we have an experience of dealing with the people who are trying to articulate themselves. Sometimes, clients come with open-ended briefs while sometimes one is dealing with a product manager who thinks he knows exactly what he wants to do and how he wants to do it. The creative licence is a bit curbed but none of that scares me as we now know how to deal with both the conditions. I would take the brief and if I have a core idea and if I knew exactly how I wanted it, I would put it down on paper. I am the only one who uses pen and paper in this office so I sit with a bunch of tracing sheets on my table and three pens in different inks to sketch out my thoughts. I think graphically, in monochrome and in form with a hope that my colleagues can grasp what I am trying to say from my drawings. There are specialists in the team and thus, it becomes important not to step on their toes. Sometimes a fresh sculpted idea will come from a graphic designer and sometimes an architect will substantially contribute to the graphic quality of the project. My teams are fluid in their composition. RATAN J. BATLIBOI is the principal at Ratan J. Batliboi Consultants Pvt Ltd. – a three-decade multidisciplinary design practice. The firm has a significant and critical portfolio of Architecture, Urban Design and Planning, Interior Design, Retail Design and Exhibition Design. The office produces work of high quality and standard with a belief in an integrated and interdisciplinary approach to design. With over hundred professionals working out of 8000 square-feet office in central Mumbai, the practice works on design projects of great diversity in multiple scales and typologies. Immersed in contemporary ideas on design, Ratan J. Batliboi Architects has stayed away from a signature style responding to each project and its unique framework in its specific context. DIALOGUE chronicles a conversation with an eminent architect / designer / thinker on an idea or issue pertinent to contemporary design practice in India. 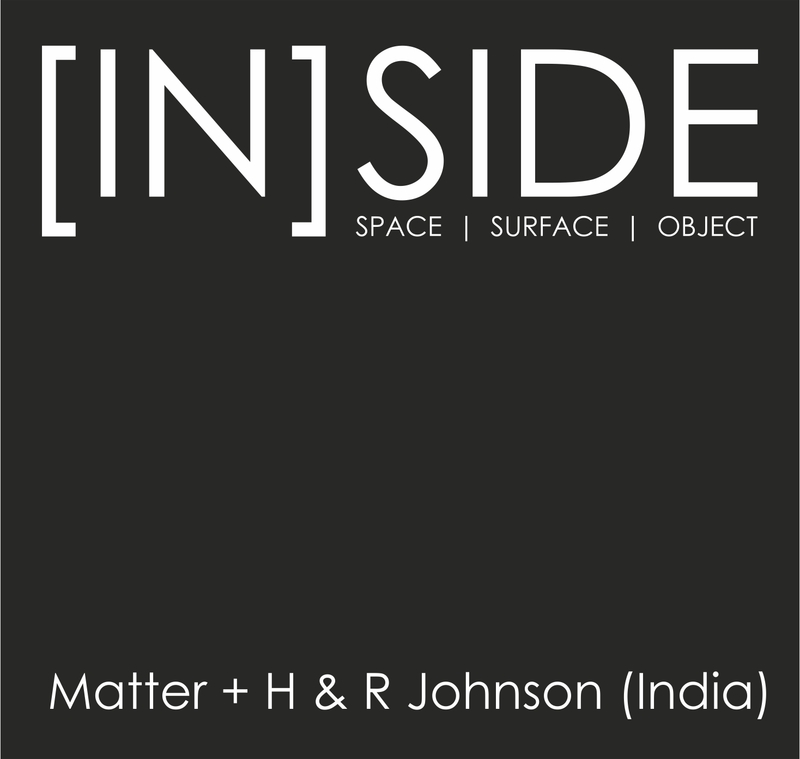 [IN]SIDE is a series of bi-annual journals published by Matter in collaboration with H & R Johnson (India) on Contemporary Architecture and Design in India. This interview was recorded as a part of the editorial process for [IN]SIDE Volume 1, Issue 1.